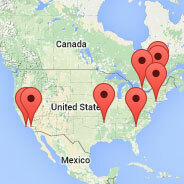 Here is a map showing the locations of the people who took up the challenge to build a Giant Nutcracker. 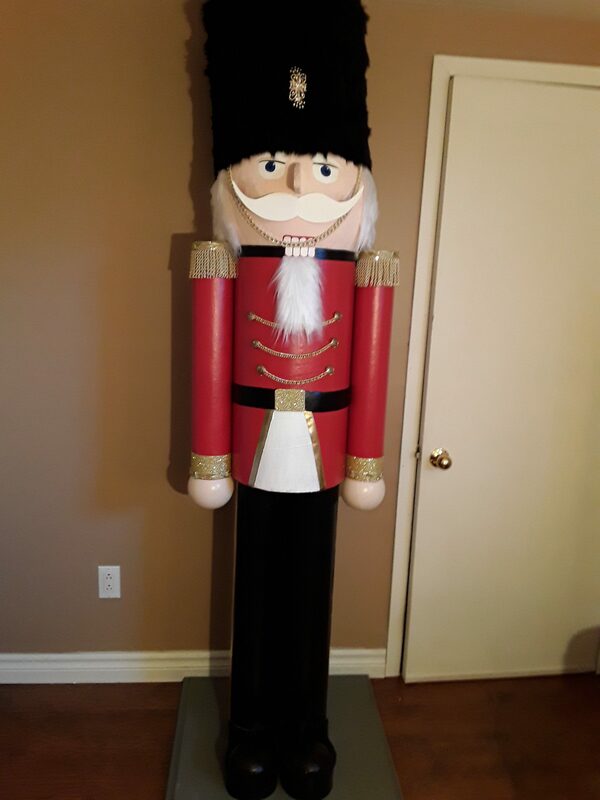 Where available, I have added a picture of their nutcracker. 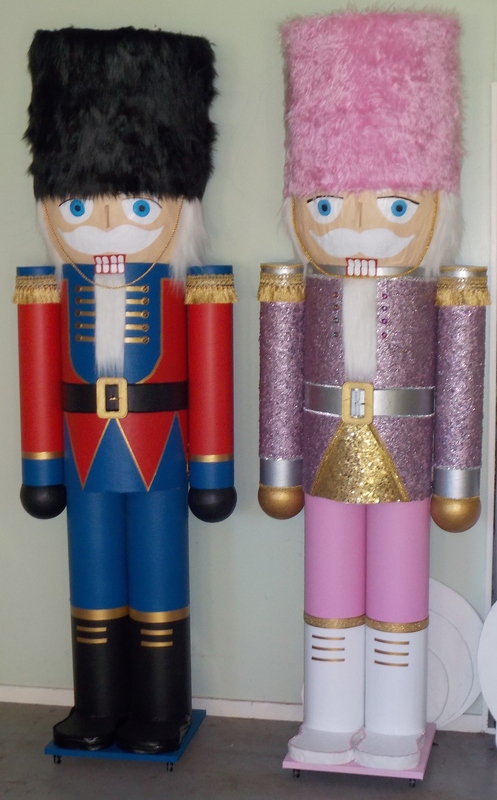 If your nutcracker picture isn’t here yet, please leave a comment below and attach your photo! To protect your privacy, the map only shows first names and approximate locations. If you want to correct your data, or if you want to be removed from this map, just let us know. It had long be my dream to build a nutcracker bigger than myself. 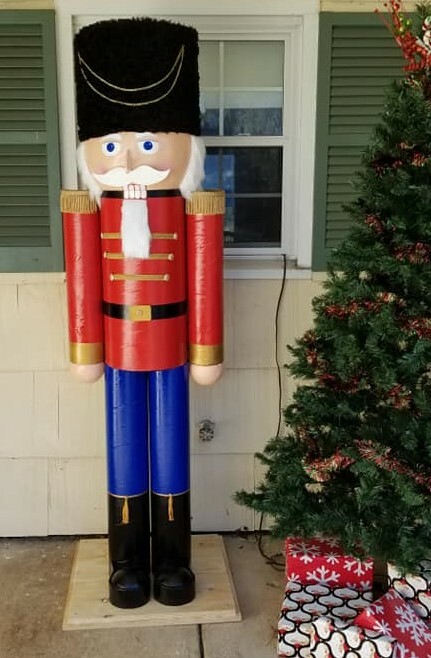 I had started collecting big cardboard tubes, and I even bought a big construction tube that I was going to use for the body of my giant nutcracker. Then last year in the summer, I decided to go ahead with my project. I thought I would get an early start on Christmas, and I am glad I did. Because I had to keep the other Animaplates projects coming as well, it took me until November to finish it all. 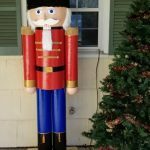 Right from the start, I had decided that I would make not one but two nutcrackers, and donate them to the Trees of Hope charity that I had worked with in the past (see here). 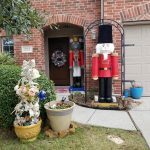 That also solved the problem of what I would do with my creations after Christmas, since I don’t really have enough room at home to store two life-size nutcrackers. Of course, I had filmed and photographed every stage of my work, so that I could share my experience with you, the members and visitors of the Animaplates website. 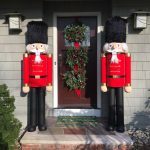 This year, I am publishing the explanations for my first nutcracker, inspired by the ceremonial guards in London and Ottawa. Actually made two of them for outside my front door. We’ll see how the paper mache responds to the weather. Thank you joelle! It’s beautiful! You could protect the paint with a clear waterproof (not acrylic) varnish. I don’t know about the fur, though. 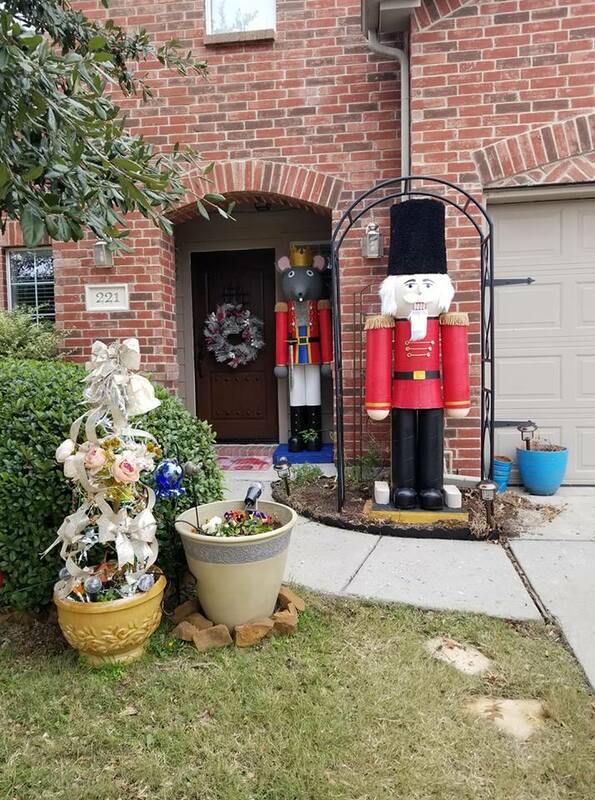 Do you have a picture of the two nutcrackers outside your door? 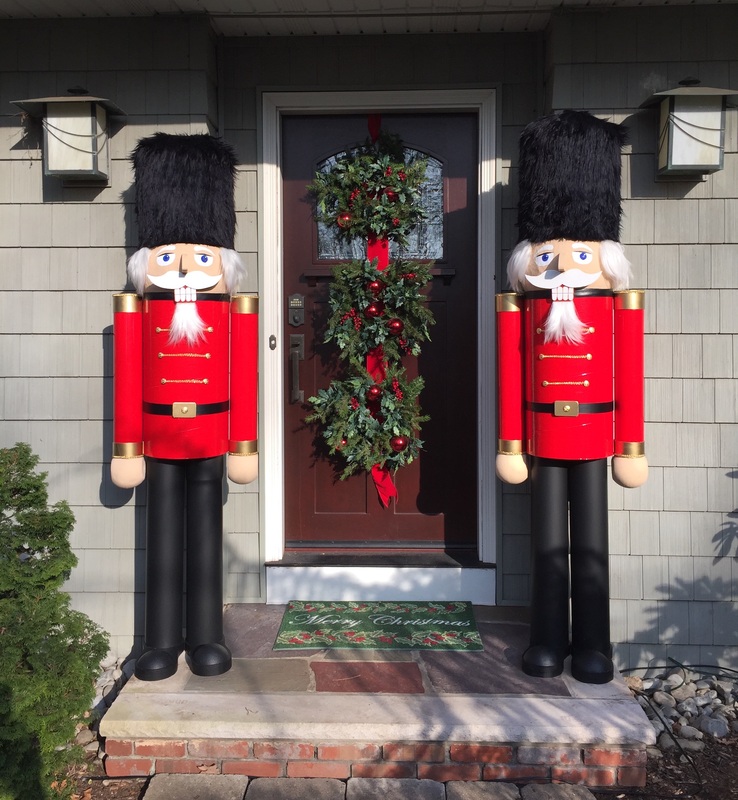 Here they are guarding our front door. I made a few changes to the plans, using plywood instead of cardboard for the shoes and inside the torso. I cut keyhole slots at the top of the arms and dropped them onto exposed bolt heads at the top of each torso. The hats are made from wire fencing. The mouth is a separate piece of wood so it looks like an actual nutcracker mouth. The cuffs are extra pieces of pvc tubing slit and glued over the sleeve ends. Your plans were excellently done. Thank you. Biggest problems I had were making the heads and finding the correct tubing for the legs. 6″ DWV PVC pipe was all I had so I cut 1.5″ slits lengthwise and compressed the pipe to a smaller diameter. I screwed the edges to a length of wood inside the pipe. I attached a screen door spring to the top of the hat and threaded a wire from the spring to a hole i drilled in the bottom of the torso floor. I pulled the wire tight and fastened it. The hat and head then became fixed by the spring loading. They can be positioned easily and will not blow off. Wow! What a great idea to make two. Thank you for explaining all the things you did to adapt the design to your materials. Interesting way of attaching the head; I didn’t have to deal with that problem since mine were for indoor use. Thanks again for the pictures. I put this one on the map. I didn’t see my pair of nutcrackers on the map. I’m in Old Tappan, NJ 07675 USA. I have corrected that now. Thanks for pointing it out. 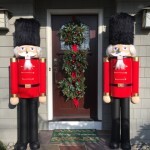 Hi I’m from Auckland New Zealand and I made two nutcrackers for different parts of my house at Christmas. It was hard to get everything that you used because is New Zealand not everything in available. The hardest thing to find was the cardboard tubes because builders don’t use them here so i had to use very thick cardboard tubes that had to be cut with a electric saw. Hi Rochelle! 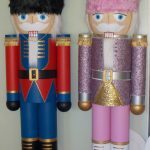 I am glad that there are now two giant nutcrackers in New Zealand! I love your two nutcrakers….especially the pink one with the top in a silvery colour. Very original! I am sorry that you could not find the construction tubes. I suppose that from one country to the next, construction techniques vary. In Canada they use those tubes to pour concrete for fences for example. Would it be possible for you to send a bigger picture? Thank you! Thank you! They’re really beautiful. (Click on the picture to see them full size). I added you to the map. 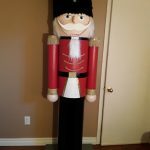 Here is one of the nutcrackers, since i have a huge garage i am making three. Two the same color and one blue and white. This may be used for a union party hosted by the mill close to here. What fun it is to make. Now how about a giant balerina?? PS : we have also a French website (Animassiettes). 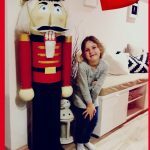 Thank you for sharing your picture! The nutcracker is very beautiful 🙂 I suppose that your daughter enjoyed working with you on this big project! Thank you for the wonderful directions. 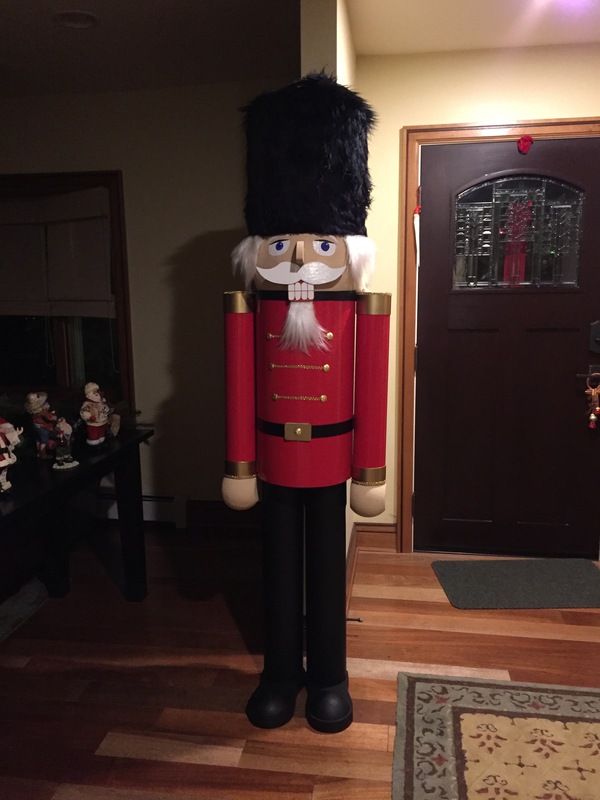 Here is my nutcracker. So proud of him! 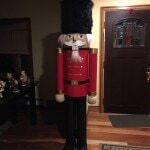 Thank you very much for sharing your beautiful nutcracker! 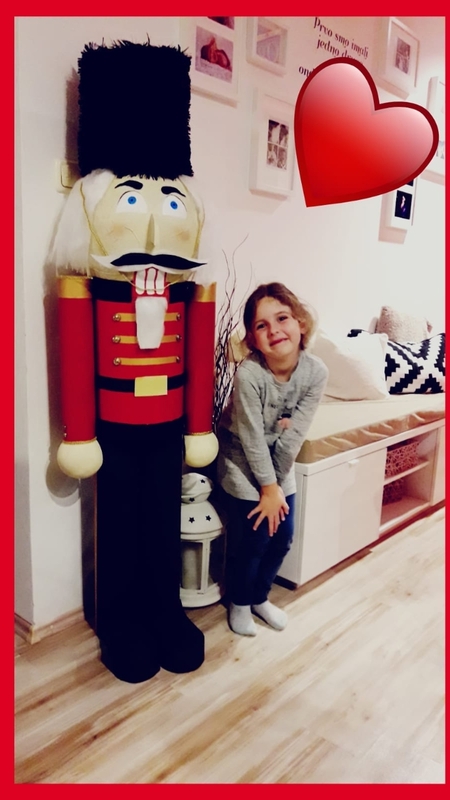 Can you tell me in which city you live so we can add your picture on the map of the nutcrackers around the world 🙂 I wish you a Merry Christmas and Happy New Year! I was going to make two nutcrackers but decided to made a nutcracker and a mouse king. They turned out much better than I anticipated. Forgot to mention that I am in Anna,TX. 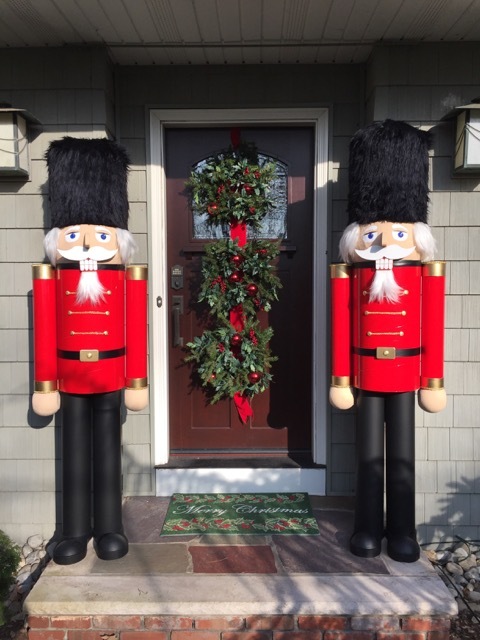 Thank you for sharing the picture with your two nutcrackers! Your neighbours must be jealous to see your house so nicely decorated for Christmas!